When it Comes to this Category, we have achieved most of the success through this range of Ayurvedic Product. 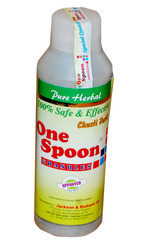 Our USP Product i.e "One Spoon" enlisted under this category is one of the best products which has attracted massive number of clients through its fabulous results. Jackson & Rickson proudly announces this Category of Ayurvedic Range giving you best outputs and definitely insists you to "Try it once at-least "
Being a market leader of this domain, we provide clients with high grade of One Spoon Granules at reasonable prices. Made from 100% herbal and natural ingredients at the vendors’ end, the one spoon granules are effective against prolonged constipation. In addition to this, one spoon granules reduces extra fat and improves the digestion of the user. The most common disorder is perhaps Constipation.Those leading an easy, sedentary life and consuming rich food are more prone to it than others. Usually chronic constipation is a result of faulty diet and life style. Intake of refined and rich foods deficient in vitamins and minerals, insufficient intake of water, intake of large quantity of meat, excessive use of strong tea and coffee, insufficient chewing, overeating and wrong habits of eating and drinking, all contribute to poor bowel functions. Other causes of constipation are faulty and irregular habit of defecation, frequent use of allopathic purgatives, weakness of abdominal muscles due to sedentary habits, lack of physical exercise, emotional stress and tension. The main symptom of this disorder is the urge to pass stool but inability to do so. If constipation continues for some days, it may lead to a feeling of heaviness in the abdomen and later headaches, lethargy, loss of appetite and total apathy. The inability of the intestine to expel the waste matter leads to flatulence. Constipation continuing for a long period may lead to distention of the stomach and severe discomfort. Looking for Ayurvedic Granules ?